I have the privilege to meet with many SOLIDWORKS users: it is truly the best part of my job. However, I have never visited a company quite like Paul Reed Smith Guitars. First of all, everyone in the company looks like they could all stop what they are working on at any given moment, pick up a guitar, and start jammin’ out. I would imagine the company parties include a jam session – or two. There was a true sense of excitement and passion for the work that the employees were doing at PRS, and I believe that originates from Paul himself. Paul has a true passion for the work he does and guitars, in general. I have a difficult time visualizing him at a board meeting, but I did catch him on the shop floor talking to the assembly teams. He truly loves what he does, and is passionate about making guitars and improving them every day. I also spent time with the design team including R&D Product Engineer Jon Wasserman and Product Engineer Mike Cimba. This dynamic duo is focused on constantly improving the guitars, as well as designing unique and innovative production tools. I usually visit customers working in metal, plastics, or other materials, but not in wood. You cannot use the same clamps and jigs for wood as you would use for metal. Designing such accurate products in wood requires more detail and precision than I would have ever imagined. The complex shapes and tools used to carve these shapes into an instrument that must sound great, but also must be held for hours by a musician. Jon and Mike must keep this in mind when making any small change to their products. Jon has been with the company for over 12 years, and using SOLIDWORKS since he started. Jon stated that they originally needed to scan in the guitar prototypes, then make small modifications to the guitars for production. 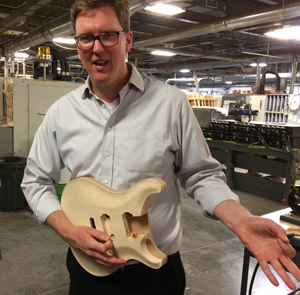 Today, they can start any new design within SOLIDWORKS…no more scanning…and the team can conceptualize new guitars right from SOLIDWORKS. The high-end guitars that are developed here are truly a mix of art and technology, and you can see that in the final guitars that are produced by dedicated team at PRS. This post was originally published by Cliff Medling on the SOLIDWORKS Blog and is being reposted here with permission from Dassault Systemes SolidWorks Corporation.